Scrooge, Tiny Tim, the Ghost of Christmas Present, Future and Past are back. 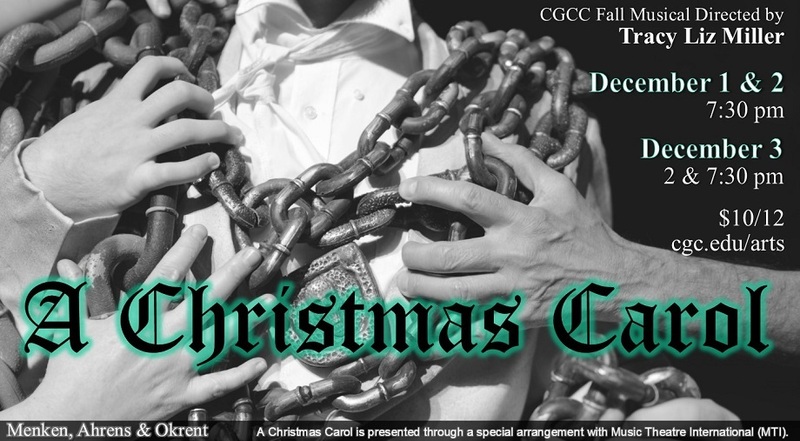 Chandler-Gilbert Community College’s (CGCC) presentation of the Charles Dickens classic “A Christmas Carol” will once again usher in the holidays at the Arnette Scott Ward Performing Arts Center in Chandler on December 1st – 3rd. “A Christmas Carol” has evolved into a biannual performing arts tradition at CGCC, but it has also become a community-centered event that embraces the season of giving. "Any kind of service to the community is a great addition to our hard work in rehearsals," explained Marc Denton, production Music Director and Director of Choral, Vocal and Piano Music Studies. This year the production is partnering with the CGCC office of Student Life's campus-wide Adopt a Family program to sponsor a food drive. Their contribution will be non-perishable food that audience members can bring to the show. Food donation baskets will be at the box office to accept donations. "I think it is important for the cast and crew to not only work hard to deliver this beautiful story about Scrooge's journey towards love, light, and charity but to also live it ourselves.” Expressed Miller. “I can't think of a better way to serve our community.” This philosophy is most underscored by the cast and crew who will adopt one of the larger families in the initiative and gather donations towards that family's needs. The Arnette Scott Ward Performing Arts Center will also be showcasing their new sound system installed over the summer. This was a dire need after the original system began to fail last year after having been in continuous operation since the building's opening in 2002. Arnette Scott Ward Performing Arts Center - 2626 E. Pecos Rd. in Chandler. Ticket prices are $12 for general admission, $10 for seniors, $10 for students, faculty & staff, and can be purchased by calling (480) 732-7343.